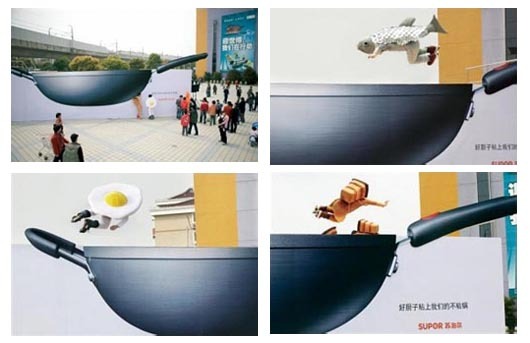 Supor’s range of non-stick pans was promoted in China using a giant wok and in-line skaters dressed as prawns, pork, eggs, carrots and fish, outside shopping malls in Shanghai. The food skaters flew up and down a ramp constructed inside the wok to demonstrate the non-stick surface. The campaign led to a 20 percent rise in sales in the selected Shanghai malls, and plans to take the event to other cities across China. The campaign won two Lions at Cannes in 2010, and a Silver Pencil at the 2011 One Show Awards. 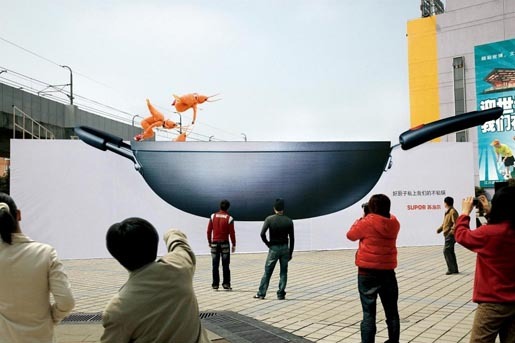 The Giant Wok campaign was developed at Leo Burnett, Shanghai, by executive creative director/art director Gordon Hughes, executive creative director/art director/copywriter Amanda Yang, creative director/art director Forest Young, copywriter Donna Dong, illustrator Dicky Lui, typographers Lin Wei-jin, Handsome Wong, designers Sean Qu, Lin Wei-jin and Handsome Wong, photographers Eric Dang, Nicholas Siau.